Micro Waterj et LLC has expanded their line of Precision Waterjet Cutting Machines to include the new micro water jet ® C4 . This new model incorporates all of the precision features of the original waterjet machine into a unit with a smaller footprint. Shops where available floor space was a concern or where wider substrates aren’t necessary can now include the micro water jet ® C4 in their operations with ease. The C4 features a footprint of 1,500 mm x 1,800 mm and travel range for X/Y axes of 540 mm x 320 mm and 50 mm for Zaxis. Precision is key with the micro water jet ® C4 . With a positioning accuracy of ± 0.003 mm, cutting accuracy of ± 0.01 mm (depending on material and thickness) and kerf width of 0.2 mm (0.008″), users are assured of part-to-part consistency. And, a narrow kerf width, minimal burr on the cutting edge, and little to no rework (finishing) results in higher quality and faster production. The micro water jet ® C4 provides high cutting speeds with utmost accuracy and surface quality equivalent to N7 or Ra1.6 μm. Low cutting forces and no thermal impact maintain the integrity of the material’s structure. Users will have the ability to cut a wide range of materials from rubber to hard alloys Micro Waterjet, LLC was formed through a joint venture between Waterjet AG and Max Daetwyler Corporation to bring micro manufacturing services for advanced abrasive waterjet technologies to NorthAmerica. They serve a broad range of markets including aerospace, automotive, electrical/electronic, machine shops, jewelry, medical, motorsports, research labs, and many other specialty applications. 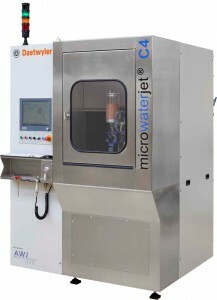 For more information on Micro Waterjet, contact us today!